Use local SIM cards on GSM carriers wherever you travel. Change carrier without being forced to buy a new phone. Increase the resale value of your Sagem if you trade up. Save money taking advantage of cheaper local phone deals. How to unlock my Sagem phone with doctorSIM? Unlocking your Sagem cell phone using doctorSIM's IMEI-based unlocking services is child's play. Fill in the online request form with the information on your phone and then select your preferred payment method to submit your request. Then all you need to do is type in the unlock code we'll send to your e-mail. Isn't cell phone unlocking illegal? Unlocking a cell phone is perfectly legal. Consumers have the right to unlock their phone from its current network for use on the carrier of their choice. Additionally, unlocking a phone will neither void the manufacturer's warranty nor damage it in any way. What happens if my Sagem cannot be unlocked? In the rare event your Sagem cannot be unlocked for any reason under doctorSIM's responsibility, we will issue you a full refund. However, we are unable to return your money if any of the information you provide on your cell phone is incorrect as the unlocking process is fully automated. It is not possible to modify or cancel your request once the ten-minute grace period has expired. How much does a Sagem unlock code cost? The cost of unlocking a Sagem device depends on the country and the network carrier the cell phone is locked to. As soon as you select these options, the price for your particular phone will be displayed on the screen. When will I receive my unlock code? Similar to the price, the guaranteed delivery time depends on the country and the original network carrier. The guaranteed delivery time and average delivery time for the previous 20 similar unlockings will be displayed on the screen when you select the network provider. However, we will endeavor to send your unlock code prior to the deadline and even on weekends. If I unlock my Sagem device, will I be able to use it on any carrier in the world? 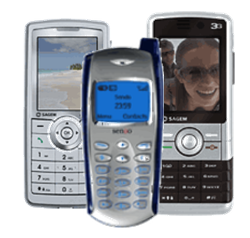 An unlocked Sagem cell phone will work on any compatible GSM network in the world. Unfortunately, you will not be able to use it on the few carriers using CDMA technology. We recommend checking with your new carrier that your phone is compatible with their network prior to requesting your unlock code. My current network won't unlock my cell phone because I am under contract. Can doctorSIM unlock my Sagem? Yes, we can. However, you are still obliged to pay your monthly bills until the contract expires or you terminate it by paying an early cancellation fee. Fortunately, even though you are under contract with one network you'll be able to use your phone with others if you unlock it. If you stop paying your monthly bills, your phone will almost certainly be blacklisted and you won't be able to use it properly on any carrier. Occasionally, a network carrier will report the IMEI number of a cell phone due to loss, theft or unpaid bill. When this happens, the phone will almost certainly not work properly in the country of origin of the network carrier. However, there is a possibility it will work internationally. If you would like to check if your phone has been blacklisted, use our free Sagem phone blacklist check which scans the databases of hundreds of network carriers. The permanent and legal way to unlock your cell phone. This method keeps your Sagem's warranty. Your Sagem never has to leave your side. Step-by-step instructions delivered 24 hours a day, 365 days a year. Fastest turnaround times on the Internet. Release your Sagem without leaving the comfort of your home. Sagem recommends only unlocking your phone via IMEI. First-rate customer support available to assist you.